On Sunday, June 19th in Beijing, Yao Ming and actress Zhang Ziyi (both Global Ambassadors for Special Olympics China) attended a send-off ceremony for the delegation that will soon be leaving for Athens for the 2011 Special Olympics Games. Pictured below are both of them answering questions from the press. For more photos from the send-off ceremony, click here. Yao Ming and Zhang Ziyi will also go to Athens for the opening ceremony of the Games. Yao told reporters he is excited, and is looking forward to seeing his old pal Dikembe Mutombo, who is also a Global Ambassador for the Special Olympics. 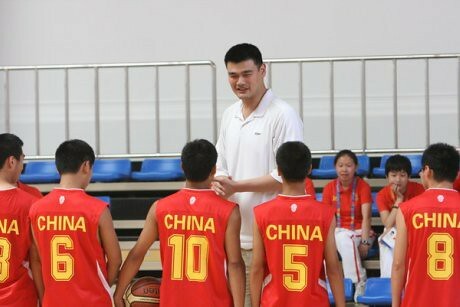 After the ceremony at the China Administration of Sports for Persons with Disabilities, Yao Ming went to greet the basketball team, and track and field team. Meanwhile, Zhang Ziyi went to greet the gymnastics team. 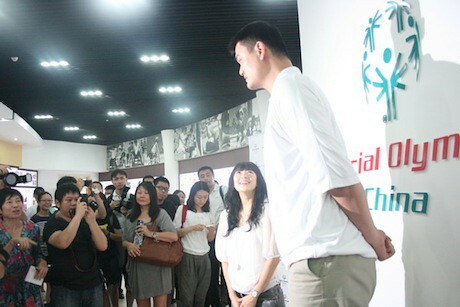 For more photos of Yao Ming and Zhang Ziyi meeting the teams, click here. This entry was posted on Monday, June 20th, 2011 at 3:17 am	and is filed under Charity work, China, Rockets' off-season. You can follow any responses to this entry through the RSS 2.0 feed.